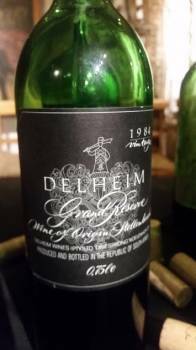 Prior to the unveiling of the 2013 vintage of Grand Reserve from Stellenbosch cellar Delheim, a tasting of the 1984, 1987, 1991, 1999, 2001, 2006 and 2007 vintages. And it was the 1984, which stole the show. Made by Kevin Arnold, now of Waterford, the wine is a blend of 88% Cabernet Sauvignon and 12% Cabernet Franc, matured for 13 months in 225-litre French oak barrels, 100% new. Abv 12.9%, RS 1.9g/l, TA 6.3 g/l and pH 3.53. Wonderfully complex nose – plenty of developed character as you might expect including boot polish, beef stock, mushroom and pine forest but also red fruit (cherries, currants) still in evidence. The palate meanwhile showed lovely composure and length making for an entirely delicious glass of wine! Haha, I didn’t say they were all good back then! I’m sure that, over time, leaf roll virus and the perceived need to make flagship wines “bigger and bigger” afflicted them more and more. Often, the further one goes back, the better they are. I’m not sure how many current red wines from a weak vintage would last three decades plus with aplomb. And don’t get me started on the in-bottle development of brett. It is a real problem on many older SA wines and serious producers attempting to create a legacy of ageworthy wines need to take a serious look at this issue.